I have had a recurring nightmare all my life that I am ascending a very narrow, steep flight of stairs to some very high place, getting more and more anxious as I go up. By the time I reach the top, I am literally on my stomach, clutching the stairs and the floor at the top landing. The fear of heights is paralyzing. I have not had the dream in a long time, but it remains in my psyche. 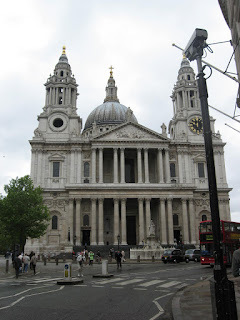 Which brings me to St. Paul’s Cathedral. An amazing structure, which I believe provded the model for the dome of the U.S. Capitol. 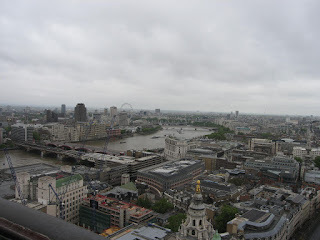 One of the coolest features is that you can go up to the dome of the cathedral, which provides the best available view of all of London. Needing to get that picture I went up and the dream came back to me in force. There are 197 steps to get to the balcony inside the dome that overlooks the sacristy. I could not get near the railing to look down. But you have to walk along the balcony to continue the climb to the outside peak of the dome. I hugged the wall around the balcony. The stairs to the top get narrower and narrower and at one point, both shoulders are touching walls. So, you get to combine your claustrophobia with your acrophobia. Then, you get to a wrought iron spiral staircase that provides a helpful view downward, way downward. Then, out you come for a stunning view. A few snaps and back down you go. quickly. I expect that dream will be returning. Thanks for the tour. The day I visited the Cathedral, the tower was closed for renovation. Thank goodness!!! Not keen on heights. The view is however spectacular.